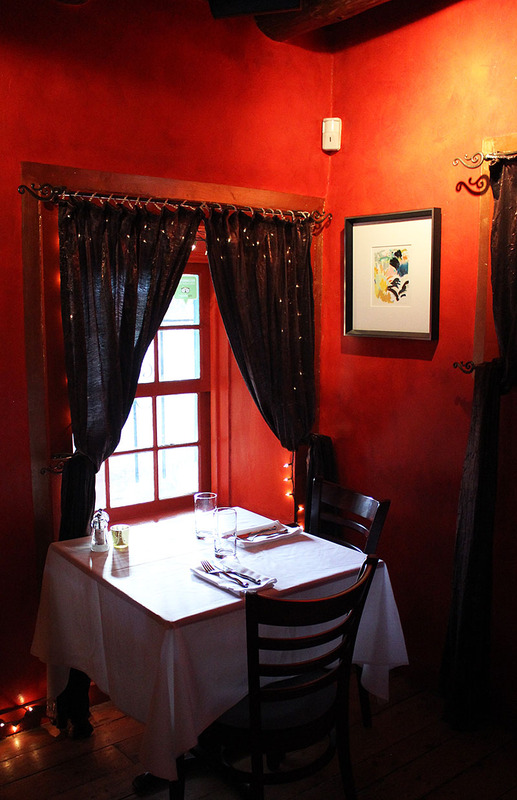 “When are you going to El Meze?” This is the question we’ve heard many many times from friends who consider it to be one the best restaurants in the entire Southwest. 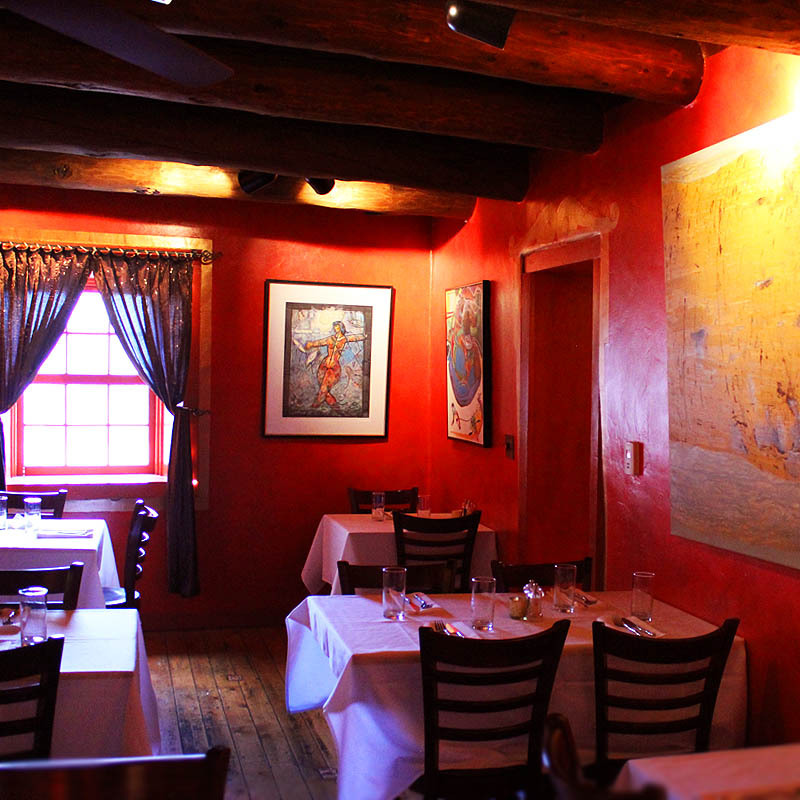 So on our recent trip to Taos, you can imagine our excitement to at long last walk into their intimate, colorful adobe restaurant. Before our dining adventure, we had the opportunity to speak with culinary master, author and food historian, Chef Frederick Muller, and general manager Annette Kratka who is also the premiere dessert chef and art curator of the restaurant. The two are uniquely passionate about El Meze (meaning the table or tapas style), imparting to customers the simplistic and rustic blend of art and regionally inspired food. 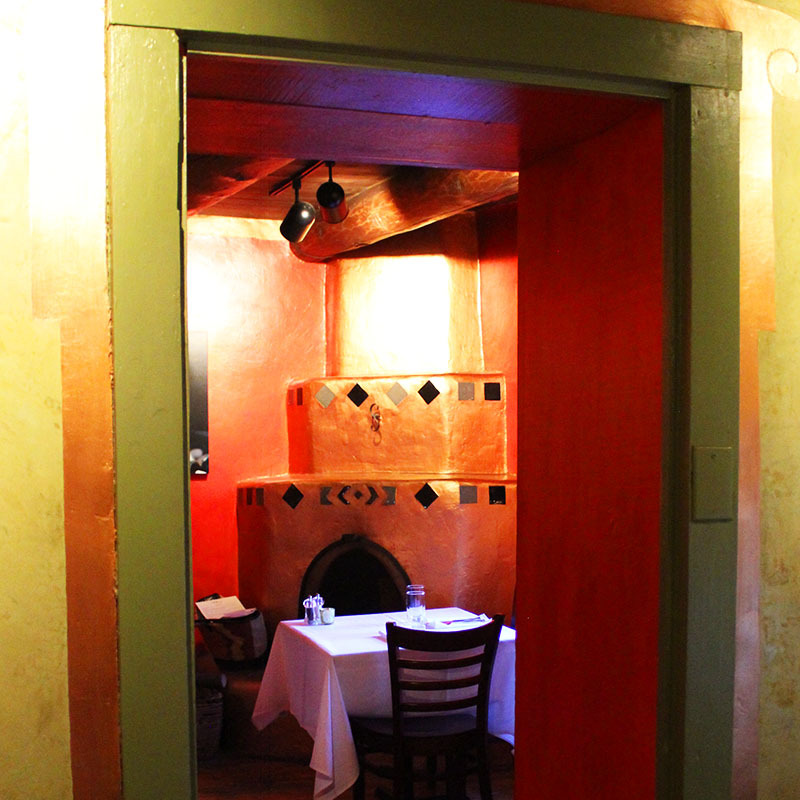 They have created an enchanting dining fusion that highlights the Moorish or Arabic influences that are a part of, and not so readily associated with Northern New Mexican cuisine. Isn’t it marvelous when a dish arrives and your mouth immediately waters at the sight of it? 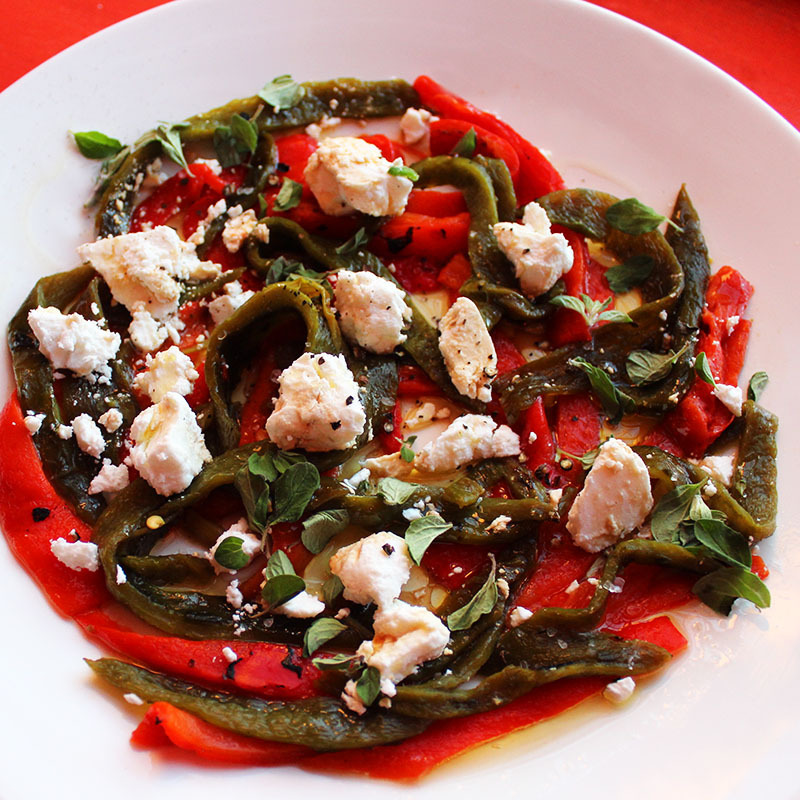 Is this aged vinegar with creamy mild chevre the most delicate flavoring for roasted chilled peppers? 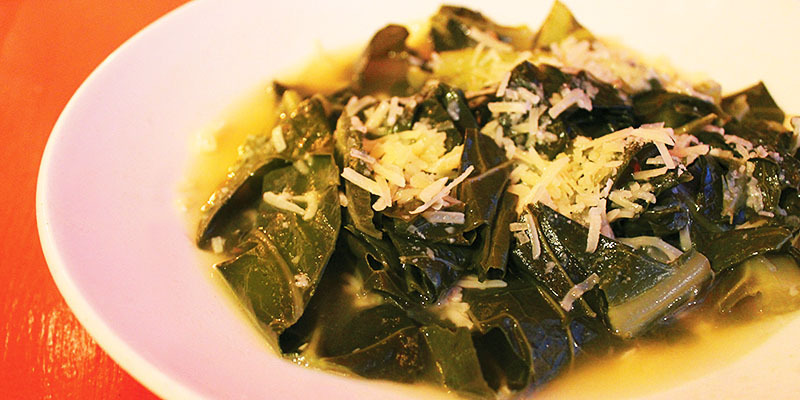 Can you remember the last time you described collards as delicate, velvety-y elegant? Isn’t it a nice touch to see this nod to chef’s southern American heritage represented on his menu? 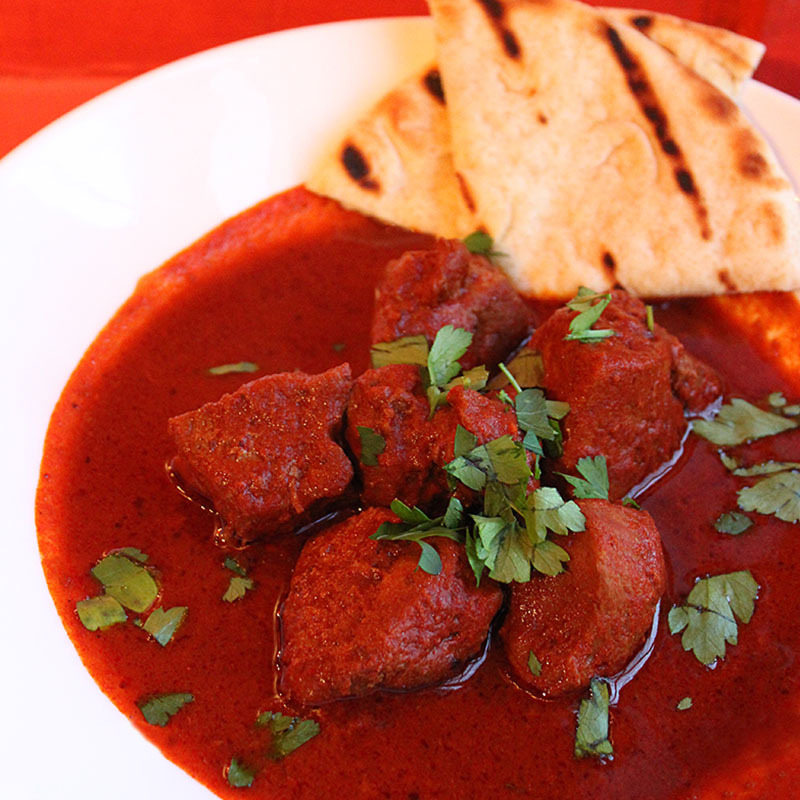 Carne Adovada with heritage pork braised in a Chimayo red chile and smoked Spanish paprika sauce. Are we nodding in unison at how difficult it is to balance red chile, that one too many pinches of seasoning can throw a dish off so easily, and this dish is perfection where the chile remains the star? Have you noticed that the dining etiquette of leaving at least one bite left untouched on your plate doesn’t apply here? 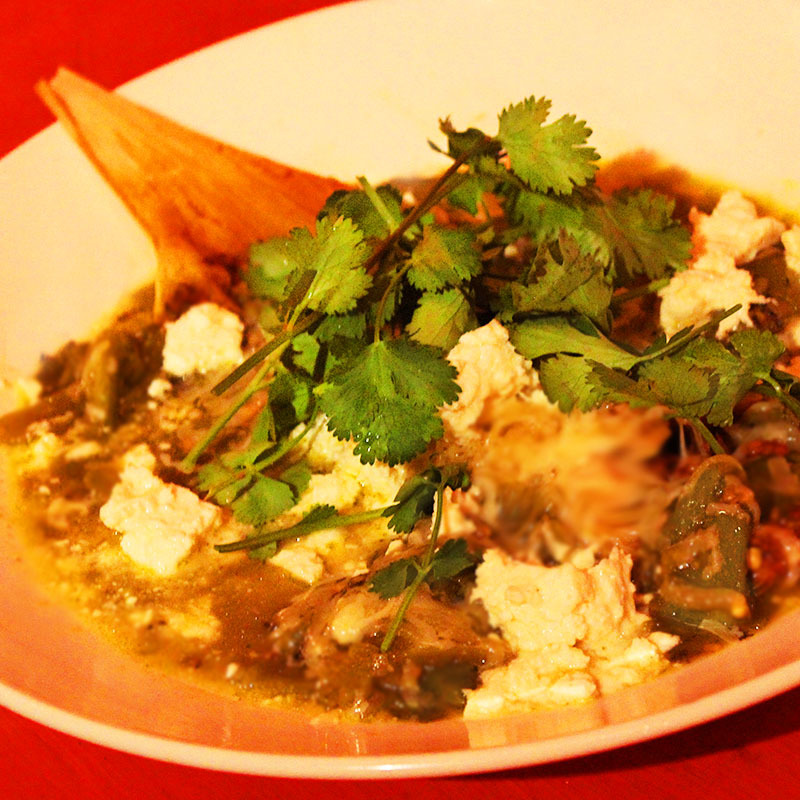 Tamale De Cardenas with heritage pork tamale swimming in a bowl of Hatch green chile, Campo de Mantaban, Tucumcari feta and fresh cilantro. Now that you’ve had a brothy pool of Hatch chile with a perfect red chile pork tamale, can you imagine eating tamales any other way? They weren’t kidding when they said ‘swimming in’, right? Is your mind wrapping around the fact that Chef Frederick’s classic training in Europe is clearly shining through with every dish, every sauce, every element, and refined restraint of over-working the ingredients? Isn’t it sublime how the cheeses provide the saltiness? How is it possible that the chef with a kitchen staff of two are doing all of this? We hadn’t noticed … were there salt and pepper shakers on the table? Is it us or are a boatload of people at other tables ordering the Truchas Yerba Buena? Could this be the trout dish that changes our general aversion to all trout dishes? Is this our excuse to return and find out? Do we really need an excuse to return? How can we possibly thank everyone at El Meze enough for one of the best meals we’ve had in all of our Southwestern travels? El Meze Website, NOTE: In 2016 we learned that El Meze had closed and while we miss this extraordinary culinary experience, we wish Chef Muller only the best and look forward to his next project. 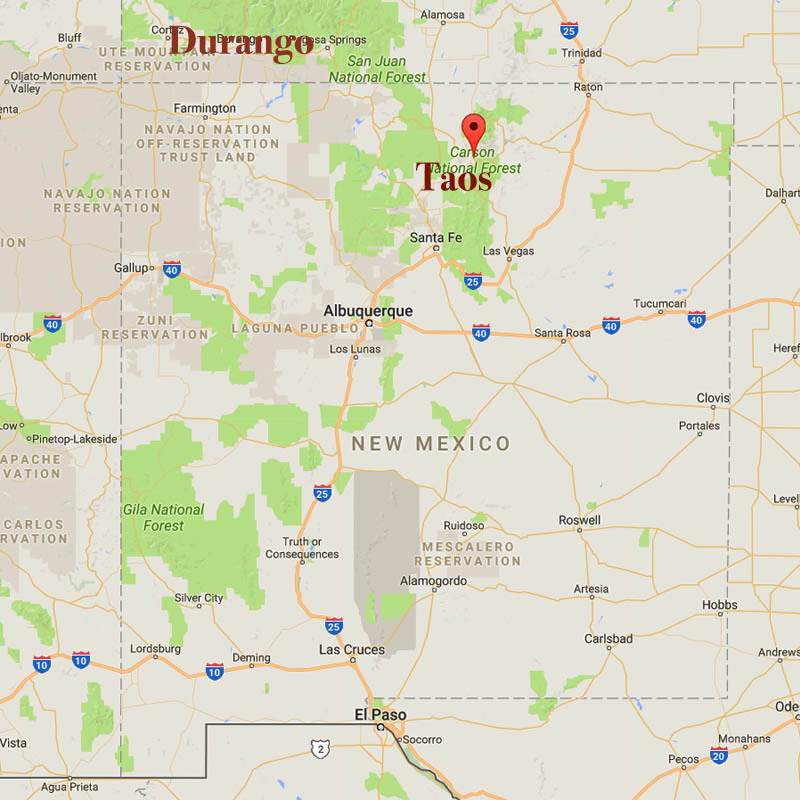 Next trip to Taos, count on it. We are hoping the swimming tamale will be waiting for us. Nina, you will absolutely love this place. Our fingers and toes are crossed that you will experience the swimming tamale. The best … ever! I have eaten there and it is truly an outstanding culinary experience! The setting is magical- I dined al fresco with the full moon rising over the mountain. The food was superb- one of my best meals period! Karen, you’ve given us yet another reason to return this summer for an El Meze al fresco dinner. How lovely! 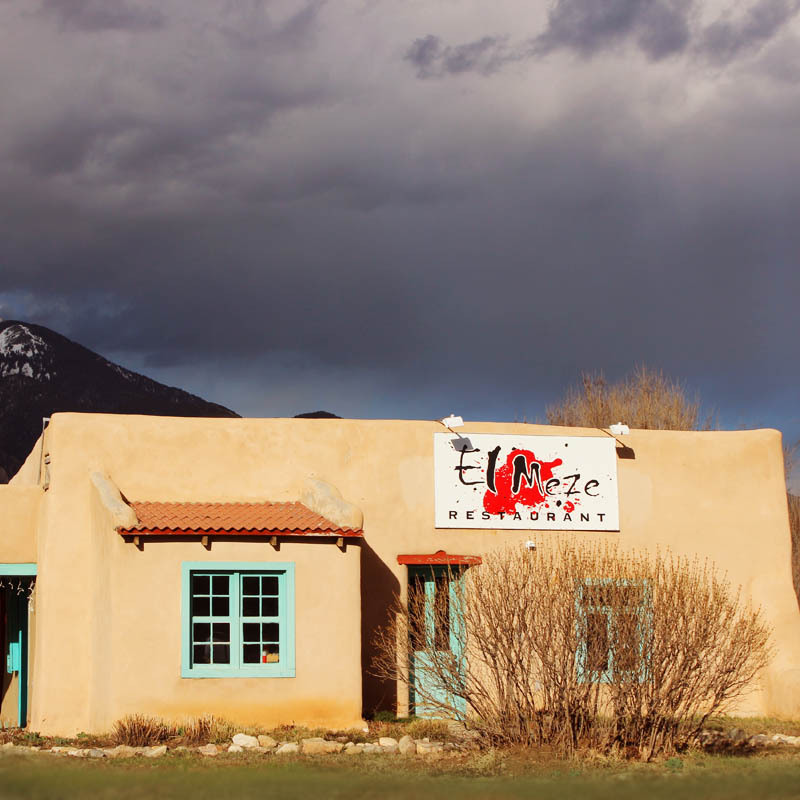 El Meze is now at the top of our list next trip to Taos. We felt like we were dining right there with you as we read the article. Your questions answered everything we needed to know to fall in love with this place. Hi True, we too have fallen for El Meze. We’ve been trying to replicate some of the recipes to re-live the experience until our next trip back. Also, we are ordering chef’s cookbook … can’t wait to try everything! This is amazing, and I want to go there as soon as possible. What beautiful photos, and the food looks wonderful. Thank you for sharing your experience. June, please let us know when you’ve experienced this extraordinary place. We want to hear all about it.